Hemet Unified School District (HUSD) was one of nine school districts in the state to receive the U.S. Department of Education’s 2014 School Climate Transformation Grant. The funds were used to support and create multi-tiered behavioral programs for students. With some of these funds, HUSD staff members began implementing Positive Behavior Interventions and Supports (PBIS) into its schools three years ago. Now all Hemet Unified schools have been recognized by the California PBIS Coalition for their continued implementation. The 24 Hemet schools that participated in the PBIS implementation were recipients of the California PBIS Coalition recognition. Hamilton High School, Tahquitz High School, Cottonwood K-8, Hemet Elementary School, Hemet High School, Idyllwild K-8 School, Jacob Wiens Elementary School received a Bronze Level Recognition. Acacia Middle School, Bautista Creek Elementary School, Dartmouth Middle School, Diamond Valley Middle School, Fruitvale Elementary, Little Lake Elementary School, McSweeny Elementary School, Ramona Elementary School, Valle Vista Elementary School, West Valley High School, Whittier Elementary School and Winchester Elementary School received a Silver Level Recognition. 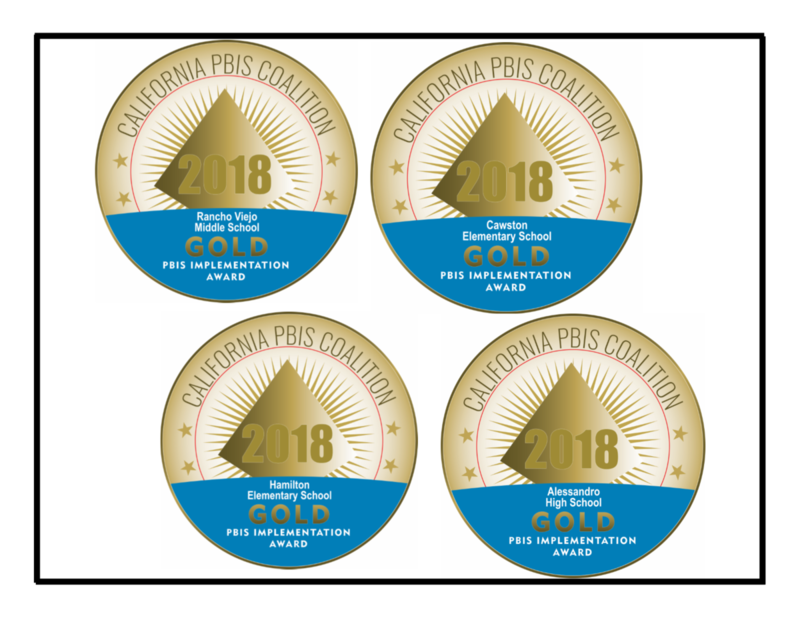 Alessandro High School, Cawston Elementary School, Hamilton K-8 School and Rancho Viejo Middle School won gold for their additional efforts in implementing the new framework. This was the first year schools were able to achieve gold status. Now that schools have the foundation of providing behavioral support for students, the district as a whole has begun adding additional support for social-emotional needs and academic support. By providing support in behavior, social-emotional needs and academics, staff is able to better support the whole child. As a part of this new initiative, the District has partnered with various mental-health and medical organizations to provide support for students and their families. In an effort to provide support to our students, the District’s four comprehensive middle and high schools are introducing an alternative to suspension class this year. The class leads students through restorative practices and activities so they can understand how their behavior has affected others as well as how they can correct their behavior in the future. Students are also able to have academic instruction which allows them to not fall behind like a suspension may cause. Last year, this class was piloted at Tahquitz High School and the school found that their suspensions decreased, attendance increased and the majority of students that attended this class for behavioral issues did not reoffend. There are many great things happening within Hemet Unified schools and we are thrilled with the recognition our sites have received in providing multi-tiered systems of support for students. Thanks to this effort staff is able to support the whole child and provide them with the necessary resources to ensure their success.